This is a series of articles celebrating our volunteers and all the work they do for, and with, Historic Rugby! The Harrow Road Café is known for its great food and welcoming ambience! A second home to villagers, the Café is a place to catch up with friends, meet new people, bask in a comfortable and pleasant environment and enjoy a delicious meal. It is the perfect place for first time visitors to feel the pulse of Rugby. Even before they enter the Café, our patrons are greeted by beautiful perennial gardens in the spring, summer and fall, and exterior seasonal decorations thanks to the hard work of Barbara and Boyd Mitchell! 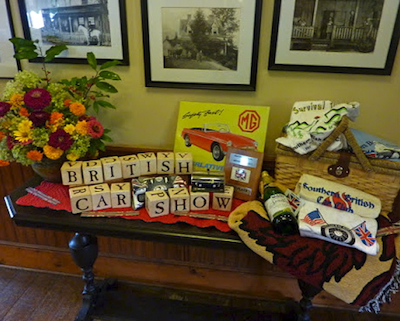 These themes are continued inside the Café with lovely displays featuring seasonal or holiday themes or vignettes tied to Historic Rugby events such as the Rugby Quilt Show, the British Motorcar Show, Ghostly Gathering, and Christmas at Rugby. 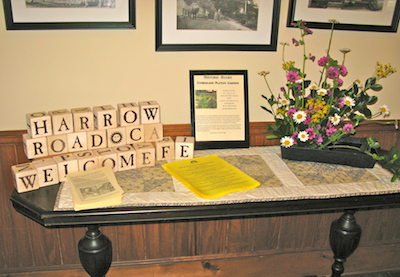 The charming atmosphere of the Harrow Road Café is consistently enhanced all year long thanks to a group of dedicated volunteers who use their many talents to develop new and inventive ways to decorate the two fireplace mantles and the main hall. For the past several years the Harrow Road Café Decorating Group has been led by Barbara Mitchell and currently includes Jody Hester, Jessie Gully, and Boyd Mitchell. Many other folks have helped out in one way or another over the years including Ron and Bethany Jackson and Rita Myers. Holidays and the Historic Rugby Calendar of Events determine what will be showcased throughout the year. The decorations may change but follow a basic theme. 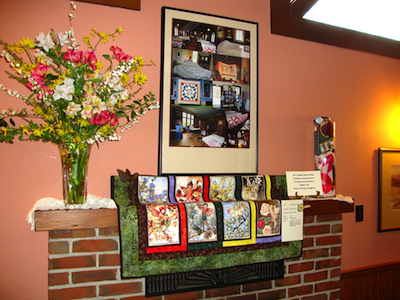 Some items that are regularly used are quilted wall hangings, large wooden blocks that spell out sayings such as: ‘Happy Holidays!’ and floral arrangements. 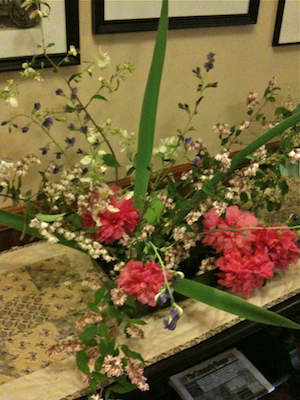 Adding a special flair to the displays, Jessica Erickson has created many stunning floral arrangements in the Japanese style known as Ikebana using natural plant materials grown in gardens or found in the wild. Natural products are favored and are used as much as possible in the decor including buckeyes, nuts, pinecones, and tree branches. All the small gourds, which are featured in many of the displays, represent the talent of Annie Patterson. Art work from local artists such as Butch Hodgkins, Donna Heffner and Mara Trumbo have all graced the walls of the Café, as have photo collages of highlighted events, put together by Barbara Mitchell. 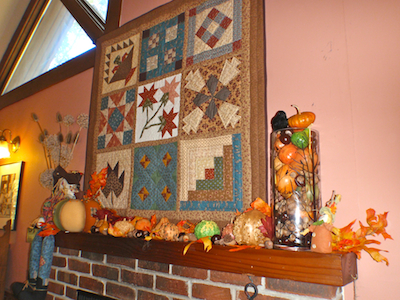 Jody Hester creates the marvelously detailed quilted wall hangings specifically for the Café and, thanks to her creativity and talent, they now have nine quilts they use during the year! Many other handcrafted articles are used, especially at Christmas. 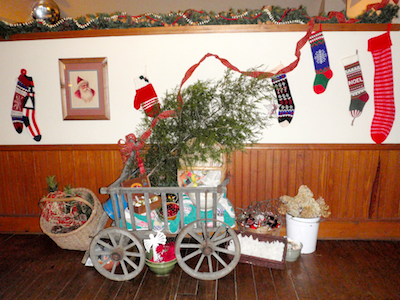 Decorations are sourced not only from the decorating committee, but also from Rugby neighbors and shops. Objects they have borrowed and incorporated into the vignettes include everything from an antique goat cart to a Victorian bat house! It really does take a village to decorate the Café! Although the villagers all help loan items for the displays, it is Barbara Mitchell’s creative vision that transforms both the exterior and the interior of the Café. We thank Barbara and her team for the wonderful job they do making the Harrow Road Café look so inviting throughout the year!